The Oxford Companion to Wine feels rather judgmental of those who grow Pinot Meunier outside of continental Europe. “Elsewhere,” it pronounces, “Meunier tends to be grown by those slavishly following the Champagne recipe (as in England and California, for example).” Last I checked, the Champagne recipe seemed to be working just fine. I haven’t had any English sparklers, but Champagne-style wines from California can be delicious. Why shouldn’t they use a recipe with such a successful track record? Perhaps the Oxford Companion would rather that the Californians and English make sparkling wines with indigenous grape varieties? But I digress. Unfamous Pinot Meunier ranks among the world’s most ubiquitous obscure grapes. According to the Oxford Companion, “…until recently, it was Champagne’s most popular variety by far, but [it] has now been overtaken by Pinot Noir.” (Chardonnay completes the Champagne grape variety trinity.) I’ve twice been to Champagne, and though I sampled many a Blanc de Blanc and Blanc de Noir, not once did I taste a Blanc de Meunier. The grape, a mutation of Pinot Noir, features almost exclusively in Champagne blends. I did once find a German Pinot Meunier varietal, as I described in this post, and I very much enjoyed its fruity character, focused spice and undertones of earth. But that post dates back to September 2012. It took another three years for me to encounter a second Pinot Meunier varietal wine. 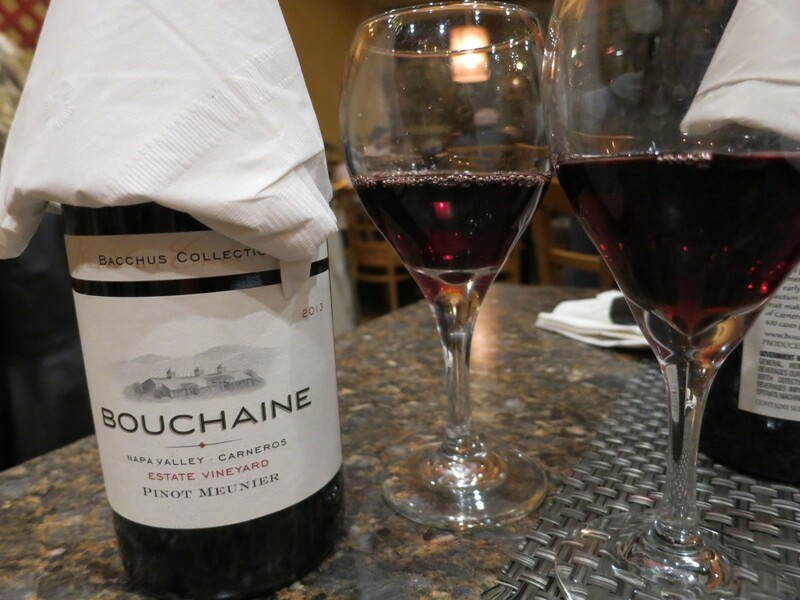 Bouchaine, based on the Napa side of Los Carneros in California, sent me a complimentary bottle of its 2013 Pinot Meunier. According to Emily in the winery’s tasting room, Bouchaine planted the Pinot Meunier with the intention of making still wine — no “slavish” imitation of Champagne was ever planned. It had a lovely dusky red-fruit aroma overlayed with some violet. A light-bodied wine, it’s not for those who gravitate towards Napa Cabernets or Argentine Malbecs. But I immensely enjoyed its ripe red fruit, broad and well-balanced acids, and light but rustic-feeling tannins. It cut right through the creaminess of a cheese blini at Kyrgyz restaurant Jibek Jolu, and it became bigger and spicier paired with a savory carrot salad. 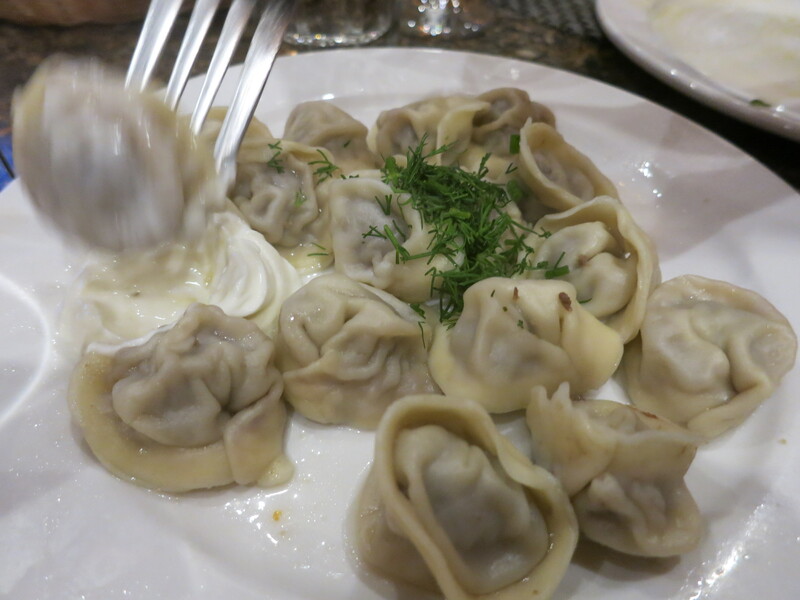 It even stood up well to beef pelmeni (tortellini-like dumplings) with sour cream. The wine was a delight, but Bouchaine grows only 3.2 acres of Pinot Meunier, planted in the lowest, most frost-susceptible plots on the winery’s estate (Pinot Meunier requires a shorter growing season than Pinot Noir, budding later and ripening earlier). I love that Bouchaine exploited the full potential of this vineyard’s terroir by using this little-known grape, rather than growing a more famous variety not as well. It’s a shame more wineries don’t follow Bouchaine’s example. I suspect Pinot Meunier’s lack of name recognition is the biggest stumbling block. I’d love to see more wineries take a risk on the variety. I wonder how Pinot Meunier might fare in the cooler vineyards of Oregon’s Willamette Valley, for example, a region already famous for its Pinot Noir. But for now, unfortunately, Pinot Meunier varietal wines remain quite a rarity. Should you encounter one — even though they tend to be rather expensive — I recommend splurging and buying it. Note: The Bouchaine Pinot Meunier was provided free of charge. The wine usually costs about $40. 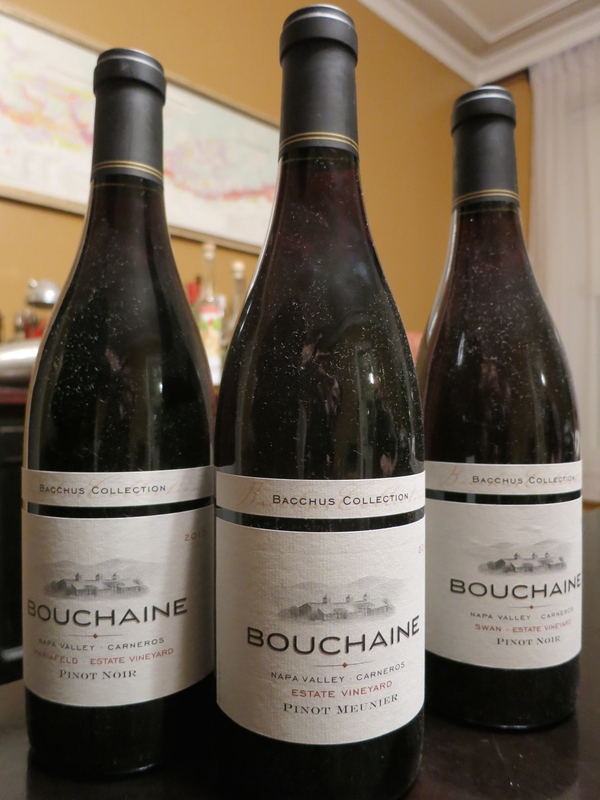 Read about my side-by-side tasting of two different clones of Pinot Noir by Bouchaine here. First, I tasted the Bouchaine PM during a visit to the tasting room. Very impressed. Have a 2011 in the cellar yet to be opened. Looking forward to it. Nice notes on the 2013. Second, I urge you try UK sparklers. They are VERY respectable and can compete side by side with Champagne. Well regarded UK estates include Wiston, Ridgeview, Nyetimber, Gusbourne, Chapel Down. The best UK sparklers all use the classic Champagne grapes. Thank you for your comment! I’m glad you enjoyed the Bouchaine wines as well, and that’s cool you got to try the Pinot Meunier in the tasting room itself. I would love to try some English sparkling wines. 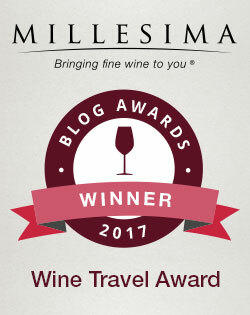 Fellow blogger Dame Wine wrote about them not too long ago, here: http://damewine.com/2015/09/the-underdog-of-traditional-sparkling-wine/. They’re a little hard to come by in the U.S., but if I find one, you can be sure I’ll snap it up and write a post about it. California retailer K&L Wines is rumored to be bringing in more Wiston (Brut and Rose) in the near future. K&L carried Wiston and Gusbourne for a while in 2014, they were our introduction to the UK sparklers. We met the Wiston winemaker in fact during a UK trip in May 2014. 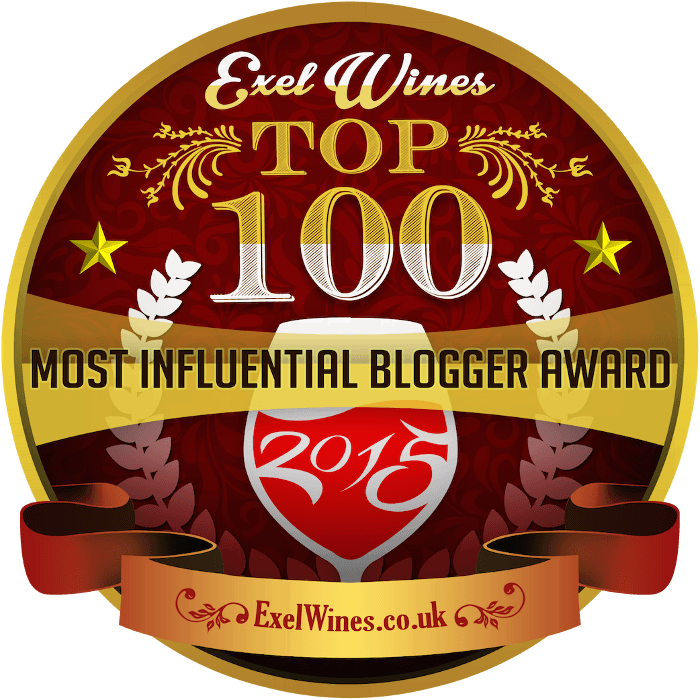 He pulls down a ton of awards for his wines in the UK. Highly recommended. Thanks for the link to the other blog. That’s great – I hope they do. And I’ll definitely look for the Wiston. I’d be fascinated to try it! You may be right about Pinot Meunier & the Willamette Valley. The early French Canadian settlers (early as in early 1800s) apparently planted Meunier in the Champeog settlement as wild vines were found growing in the forest there in the 1970s. Over 100 years later. Also, while I’m not sure of the exact date, I believe David Lett planted Meunier and made an Eyrie version at least as early as the ’70s. My understanding is the wine was only sold in the tasting room. The early bottlings (still, not sparking) were delicious. Not a common variety here in Oregon, but suspect there are more instances of Meunier being grown around the Valley. That is fascinating! Thank you for sharing that history. I love that people found wild Pinot Meunier vines in the forest from the early French Canadian settlers. And it looks like you’re quite right about Eyrie, as Jason notes below. The Eyrie Pinot Meunier sounds great! That’s interesting that it ages so well. I wouldn’t guess that a Meunier could still be stunning at 30 years old – that must be some juice! Thanks also for the additional names of people making Pinot Meunier in Oregon. Hopefully I’ll be able to find yours or one of theirs here in Chicago. I’ve had the Darting, and I loved that one, too. I’ve also got 5 acres of Meunier planted here at Left Coast Cellars. Started our sparkling wine program with it in 2011 as well as the last two (warm years) have followed through with some gorgeous red still wine. Wow, it seems like there are a bunch of folks making interesting still Pinot Meunier wines! Now if only we could get some here in Chicago. Our largest wine shop, Binny’s, just carries the Darting Pinot Meunier from Germany. Not a single domestic bottle! What are you waiting for, Binny’s?